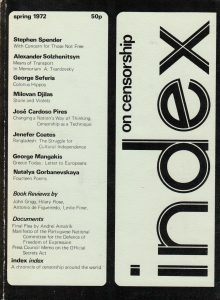 “With concern for those not free” The spring 1972 Index on Censorship magazine was the first issue. Read it now for free. Index on Censorship is pleased to announce that the online archive of 45 years of publications of Index on Censorship magazine, published by SAGE Publishing, will be free to read globally. Free archive access will cover the years 1972 to the end of 2017, and will give students, researchers and those interested in research and reading on freedom of expression online access to journalism and reporting about freedom of expression issues, plus stories by and about censored writers and artists. The archive is available on the SAGE Publishing website, where users can browse by year or keyword search. Until now, access to the Index on Censorship magazine archive has been through paid subscription. From February 21 2019 all back issues of the magazine, excluding the four most recent issues, will be freely available. Since its establishment in 1972, Index on Censorship magazine has published some of the greatest names in literature including Samuel Beckett, Nadine Gordimer, Mario Vargas Llosa, Hilary Mantel and Kurt Vonnegut. It also has published some of the greatest campaigning writers of our age from Vaclav Havel to Amartya Sen and Ariel Dorfman plus journalism from Mexico, Argentina, South Africa, China, India, Turkey and more. Editor Rachael Jolley was named British Society of Editors’ editor of the year in the specialist publication category (2016) and the magazine has received numerous awards including the APEX Award for Excellence and the Hermann Kesten prize. With each new issue of the magazine, an archival issue will become available for students, researchers and supporters of free expression. The four latest issues of the magazine are available for purchase in print or digital formats via SAGE Publishing, bookshops and Exact Editions. BFI, Serpentine Gallery and MagCulture (London), News from Nowhere (Liverpool), Home (Manchester) and Red Lion Books (Colchester). Buy one or more issues. Download the preview app (21 pages of latest issue for free), free upgrade the preview app to a 30-day subscription.